Serger machines resemble regular sewing machines but they come with more functions than those available in conventional sewing machines. Most of the features available in a serger machine exist to give a professional finish to clothing. So, a serger can bind fabrics together with overlock stitches. Three to four stitches are used to create the overlock stitch and give the finishing that can be seen on many readymade garments and shirts we buy from the stores. Serger sewing machines with industrial level functions and capabilities are called industrial sergers. Industrial sergers have more advanced features than regular serger machines and they are more durable than other sergers. There are plenty of industrial sergers currently available on the market which may make it hard for you to find the one that is right for you. We have done the legwork for you and found the best industrial serger machines currently available on the market. We will discuss their features, functions, and capabilities to help you find the best industrial serger. But before that, let us take a look at some things you should consider before buying an industrial serger. For simple, strong seams, you could use either a 2-4 serger or 3-4 serger machine. However, if you want super versatility and adaptability, we prefer you to go with a 2-3-4 serger. Most of the industrial standard serger machines are 2-3-4. Differential feed is used to adjust the mechanism that’s used for feeding the material under the needle. If there is a differential feed in the serger machine, you can adjust how your fabric is fed to eliminate stretching, puckers, and seam ripples. The quality of your stitch will thus improve which is crucial especially when you are working with stretch, knitted or extremely thin fabrics. A four-thread machine is generally used by home sewers but commercial users prefer an eight-thread serger. Some industrial sergers come with color-coded threading to avoid any damages to the machine that results from the machine being threaded poorly. Threading can be difficult with a serger machine when there is no auto threader. That’s why we recommend you get a machine with an automatic threader. If your machine doesn’t have this, then make sure that it comes with either easy-to-follow instructions or a color-coded path for simple threading. Threading a serger is not just about having the thread go through the needle eye. It must frequently go through several channels in a certain order. If you have a manual threader, you would need tweezers to thread the machine. Beginners generally take 30 minutes to re-thread a serger while more experienced sewers may get it done within 15 minutes. 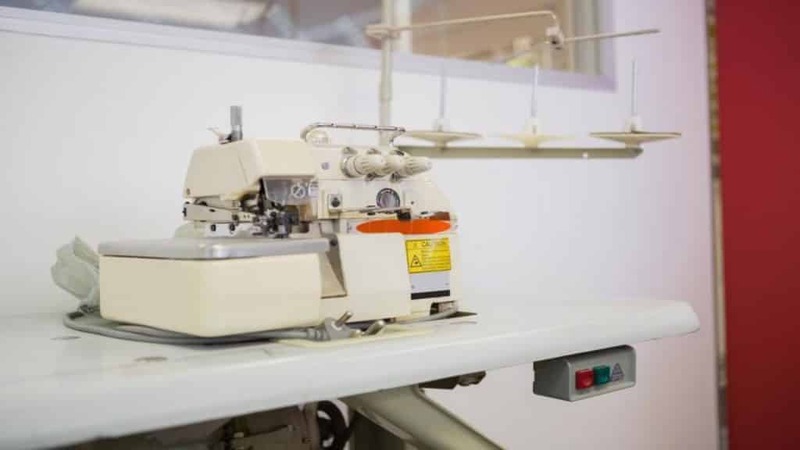 You should look for an industrial serger with adjustable tension as it will allow you to adjust the tension according to the requirements of your fabric. Most industrial sergers come with a pair of tweezers, multi-purpose foot, and needles. You may also get screwdrivers that are required for changing needles, oil, scissors, hex wrench, and a cleaning brush. Sergers with a free arm make hemming of cuffs much easier. The versatile Singer 14CG754 is easy to use and offers four, three or two-thread stitch capability. This serger comes pre-threaded and you can use it right after getting it out of the box. You can see exactly how the serger machine is threaded. When you have to re-thread it, you can follow the instructions on the color-coded guide. This machine has extraordinary features – everything you would expect from an industrial serger. The upper knife in the machine is easy to remove allowing you to prevent trimming of fabric during the sewing work. Adjustable differential feed of the machine helps eliminate stretch and puckering of fabric and 4 built-in hems provide greater finishing options. The length of the stitch is adjustable from 2mm to 4mm while the width of the stitch is adjustable from 3mm to 7mm. The Singer 14CG754 comes with a free arm, allowing you to easily and quickly hem cuffs and sleeves. It also lets you work on smaller pieces like children’s clothing. The package comes with a needle set, small screwdriver, tweezer, spreader, foot pedal, and an intro DVD. 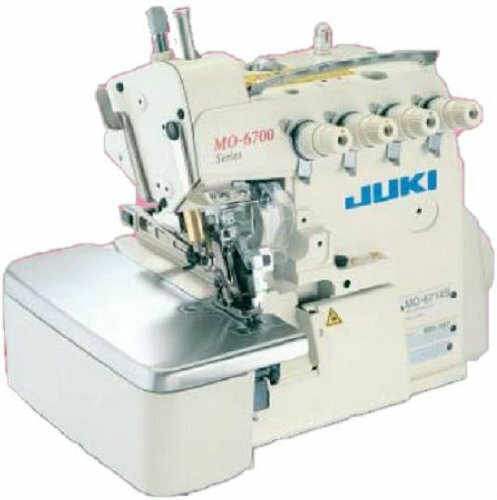 The Juki MO-6714 is an immensely powerful industrial serger sewing machine. 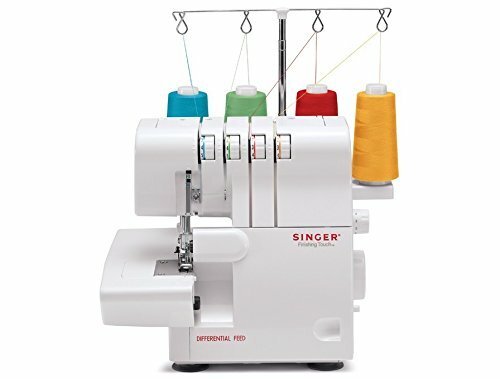 This machine is limited in terms of stitch options, but this two-needle, four-thread model features a powerful servo motor for incredible speed. The semi-automatic serger machine guarantees increased productivity, flexible stitches, and remarkable finishing quality. If you are looking for an industrial serger machine without the bells and whistles available in most of the home models, then this could be the right serger for you. The powerful SC-510 control box ensures even, tight stitches on every project. There is a stitch on the control box’s front panel for easy adjustment. The length of the stitch is adjustable between 0.8 millimeters and four millimeters while the width of the stitch can be adjusted between 4.8 mm, 4 mm, and 3.2 mm. The Juki MO-6714S is an expensive serger machine and not meant for home use. It is ideal for industrial and professional use. The serger has a high speed of 7,000 stitches per minute to meet the requirements of the industry. 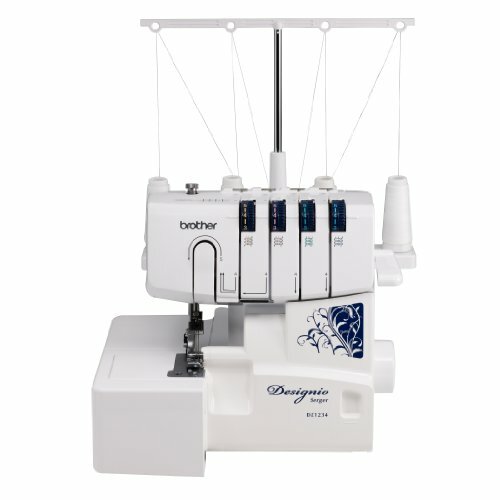 Brother Designio Series DZ1234 Serger Price: $327.65 "This machine has helped me make quick work of some pretty big projects that would have taken 3 times longer on my sewing machine." Brother Designio Series DZ1234 is another powerful serger that can meet the needs of the industry. It is specially designed for finishing projects easily and rapidly. The Brother DZ1234 features differential feed using both three and four-thread arrangement that enables better stitch quality. This serger comes with a piping foot, gathering foot, and blind-hem stitch foot. In addition, you get two sets of starter thread that will allow you to create beautiful edges and hems on many different varieties of fabrics including stretchy fabrics, formal wear, and linens. Using fabrics strips and piping cord, you can create your own piping. The weight of the Brother DZ1234 is 18.1 pounds and it’s a midrange-priced serger. The gathering foot facilitates edge finishing, fabric connecting, and simple gathering. There is a channel built into the foot to secure the material. This eliminates the need for any pins that gather single or double layers of fabric to create a serged edge. The machine has an adjustable, open-toed guide that is ideal for embellishing and utility stitching. The Brother DZ1234 can sew up to 1,300 stitches in a minute. The Janome 1000CPX is a medium-ranged serger machine with remarkable features that you would expect from an industrial serger machine. However, this machine isn’t generally used in industries and considered more of a home serger machine. The Janome 1000CPX is a high-speed, heavy-duty, long arm cover-hem machines that are ideal for a variety of projects. The machine has free-arm configurations, seam-tightening system, and cover-hem stitch that make it suitable for advanced sewers. The weight of this machine is 25.1 pounds. It’s dedicated cover-hem stitch machine and does not include any other serge, overlock or rolled-hem stitches. 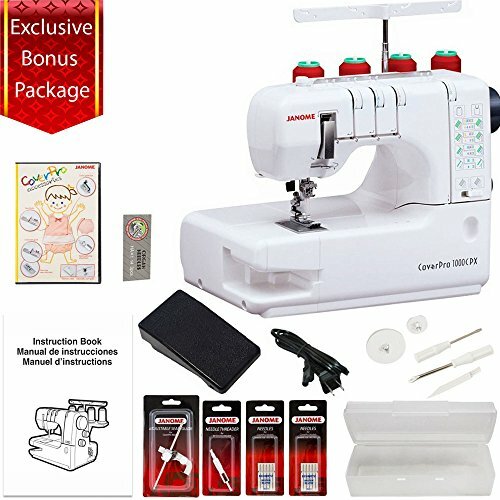 A bonus kit is available with the machine which contains an adjustable seam guide, narrow elastic gathering foot, and wide gathering attachment. The Janome 1000CPX has an extra large bed space of 4×5.5 inches, narrow stitch width of 3mm, standard stitch width of 6mm, a one-needle two-thread chain stitch, a two-needle, three-thread cover stitch, and vertical needle drop. 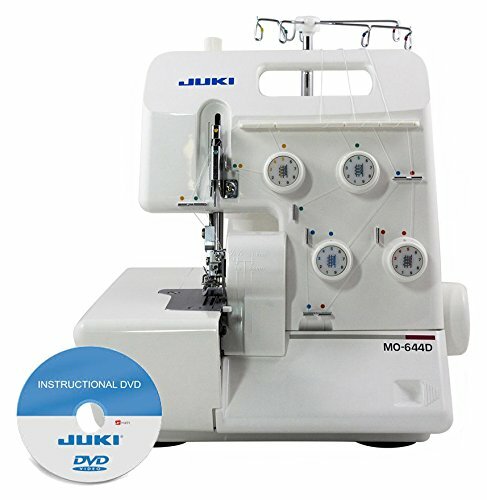 The Juki MO644D is a powerful machine that comes with several features which can only be found in an industrial serger machine. In addition to automatic rolled-hem capability, color-coded threading, and breakaway lopper, this machine features convertible two-three-four overlock serging. The Juki MO644D portable serger provides adjustable stitch length and differential feed that is helpful whenever there are waves or ruffles in the stitching. 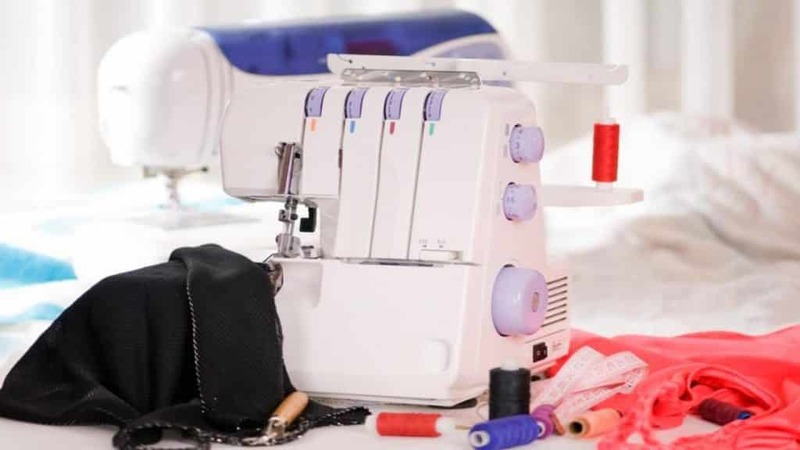 It weighs 18.6 pounds and comes equipped with multi-purpose presser foot that you can use to create a variety of stitches and for sewing products like ribbons, sequins tape, and elastic. Serger knobs, differential feed, and stitch length are located inside the machine on the left side. The Juki MO644D is an excellent choice for experienced sewers and can allow you to create simple sportswear or elegant evening wear with ease. The one-rotation thread tension dial makes it easy to adjust tension while the heavy-duty knife system ensures consistent and easy cutting of both lightweight and heavy fabrics. This machine also has a bright lit fabric and needle area. The Juki MCS-1500 is a midrange sewing machine that’s ideal for many different projects. It features cover stitch that is particularly useful for completing decorative stitches on sleeve cuffs, necklines, and simple hems. Strong chain stitch is also there that is ideal for stitching both side seams of the waist and pants. The weight of this machine is 19.8 pounds and it comes with presser foot lifter that’s higher at one end. This allows the fabric to be inserted easily when you are beginning to sew. Presser foot’s first position may be raised to the maximum of 10mm. The Juki MCS-1500 also has a simple looper threading and adjustable different feed that allows gorgeous finishes even with sheer silk, rayon crepe or knits stretch fabrics. It also features an extension plate that has seam guidelines printed, adjustable presser foot pressure, and exterior thread cutter. The Brother 2340CV is an advanced server that lets sewers create a broad range of cover stitches on all types of fabrics for decorative and constructive applications. You shouldn’t underestimate the advanced technology and features of this machine. It features cover stitches, tri-color stitch, adjustment dials for lengths of the stitch, easy looper threading, and color-coded threading. It has a presser foot dial, snap-on feet, and a differential speed that lets you modify the speed at which the fabrics feed through the serger machine. The weight of the Brother 2340CV is 16.8 pounds and using three needles and one looper thread, this machine creates chain stitch, professional hems, and decorative stitching. 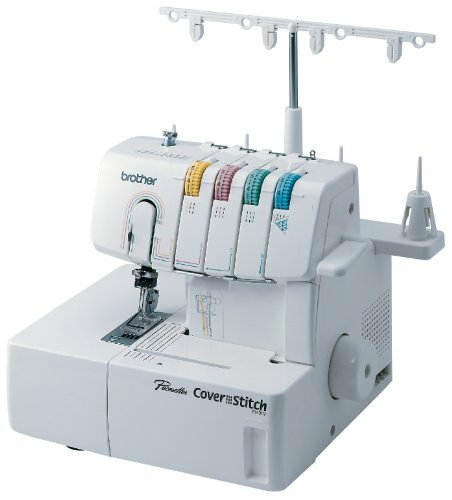 Moreover, the Brother 2340CV has slider level adjustment, lay-in threading, and a two-needle 2-3-4-thread cover stitch. The maximum sewing speed of this machine is 1,100 stitches per minute. The Brother 2340CV comes with several accessories including four-thread nets, tweezers, four spool caps, four spool mats, cleaning brush, soft cover, accessory bag, and operation manual. 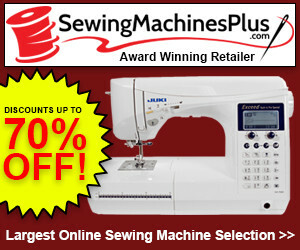 As you can see, there are plenty of industrial serger machines available on the market. The machines we have discussed vary in features, price, capabilities, and accessories included. Now if you want to buy an industrial serger that is best for you, we recommend you thoroughly study the features and capabilities of each machine and compare them. Consider the price of the machine as it is an important factor. Also, read reviews of other people about the industrial serger you intend to buy. This way many times people who have used the machine can help you decide whether it’s the right choice for you. Once you have done these things, go ahead and buy an industrial serger machine.